Pearls are a natural substance and they should be cleaned delicately. They can be highly sensitive to the rough or abrasive surfaces and chemicals that are used to clean other jewels. Cultural pearls with thicker coatings, too, are much more fragile than other gemstones. Therefore, it is extremely important to clean you pearls with utmost care, if you want to continue using them for ages. This article deals with some great tips for cleaning your pearls safely. Read on to know how to clean those awe-inspiring pearls and make them look like ‘just bought’! It is essential to clean your pearl jewelry from time to time. A cotton cloth is best suitable to clean pearls. Wipe your pearls with the cloth, using very delicate hands. Cotton cloth can also clean soiled pearls, when used meticulously and with immense care. It is advisable to wipe clean your pearl jewelry after every use, to save yourself from an exhaustive cleaning session later on. Warm water can also be used to clean your pearls. Soak a cotton cloth in warm water and use it to wipe your pearls, softly. Cleaning pearl jewelry with warm water will give it shine and make it appear almost brand new. Just take care to do the cleaning slowly or your pearl jewelry may fall apart, even with the slightest of rough handling. If you have enough time on hand, to clean your pearls, mix any mild shampoo in warm water, for the purpose. You can place the bag or pouch of pearls into the mixture and gently rub the pearls. Remember, not to put too much stress on the bag while rubbing it, as you may end up rubbing the pearls against each other. In case you are washing a pearl necklace, it might end up breaking, in such a case. The water left in the bag should be absorbed with a towel and left to dry. If your pearl jewelry is too precious, it is always advisable to seek professional help for cleaning the same. For that matter, no one can clean pearls or any jewelry better than a professional himself. So, once in a year, you can get your pearls cleaned by a jeweler. Pearl jewelry should always be kept in separate bags or pouches. Take care not to keep it in the same boxes as your other jewelry. You can even store different pieces of pearl jewelry separately, to save them from any harm. Pearls can loose their heavenly shine on being exposed to moisture for a long time. 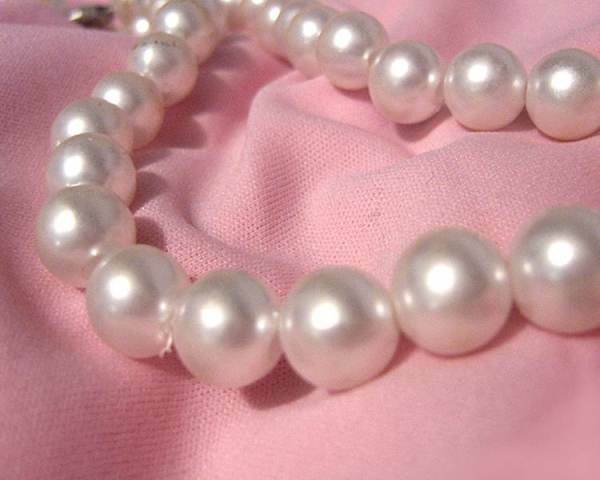 Do not expose your pearls to perfumes or any chemical-based liquid, cosmetics and perspiration. If your pearls are strung on silk or natural-fiber strand, get them re-strung every year, by a professional. Try to save your pearls form polluted air and smoke. Don’t use an ultrasonic cleaner to clean your pearls.